Lewis-Evans only participated in the World Championship for two seasons, 1957 and 1958, yet his presence was felt, capturing two pole positions for Vanwall and this despite having to be third fiddle in a team with Stirling Moss and Tony Brooks. He only contested 14 events in the championship and is largely forgotten now, but in his day he was quite highly admired and respected. His death was a shock and a cause for mourning by many young school boys. Lewis-Evans started out in the usual place for aspiring British racing drivers in the early and mid-1950's: Formula 3. He also did the usual domestic sports car races before finally moving up to the occasional Ferrari sports car drive and being a member of the Connaught team. As a driver for the team, he did notch up a win for Connaught at the 1957 Richmond Trophy race at Goodwood. In 1958, he was a member of the Aston Martin sports car team and raced in F2 for the British Racing Partnership, the team formed by Alfred Moss and Ken Gregory. The collapse of Connaught due to financial problems and the sinus problems that Stirling Moss inflicted on himself while water-skiing - as well as Tony Brooks banging himself up at Le Mans - all conspired to give Lewis-Evans an opportunity to drive for the Vandervell team at Rouen and Reims in 1957. Although he struggled at Rouen, as did the other substitute driver Roy Salvadori, at Reims he was sensational. Lewis-Evans was fast from the word go and easily led the race before the victory went to Luigi Musso in the Ferrari. He was now offered a place on the team, although it was as the third driver behind the Moss-Brooks duo. This was in part due to the fact that the obvious fact that Moss and Brooks were proven quantities, and also due to his somewhat frail health. He suffered from a stomach ulcer and the attendant ailments that accompanied such problems. Although a thorough professional - he had the same manager as Stirling Moss, Ken Gregory - his obvious health problems were a factor in some of the decisions that were made concerning his place in the team. However, Tony Vandervell liked Lewis-Evans and that was enough to ensure that his machines were as equal as possible to those of Moss and Brooks. 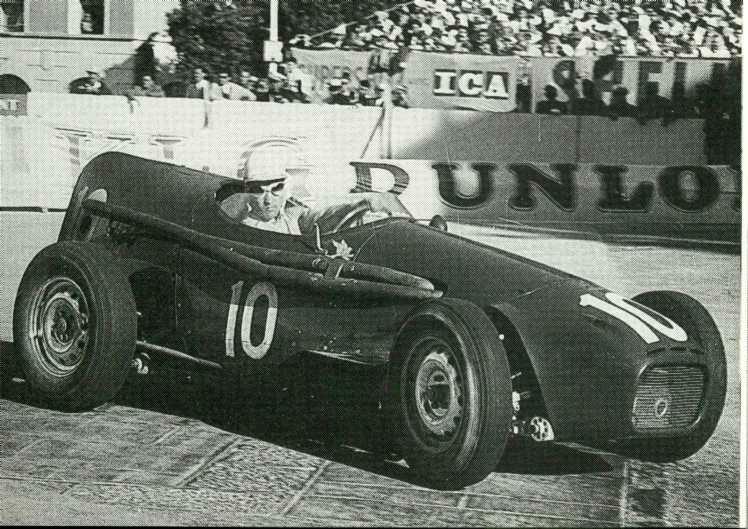 During his first season with Vanwall he finished fifth at Pescara and captured the pole at Monza. In 1958, he finished third at the Belgian and Portuguese Grands Prix and fourth at the British Grand Prix. He took his second pole at Zandvoort for the Dutch Grand Prix. He was running well at Ain-Diab when the engine seized, locking the gearbox and the Vanwall left the track and crashed, catching fire when fuel was ignited by the hot exhaust pipes. Lewis-Evans suffered extensive and very painful burns in addition to his other injuries. He was flown back to the UK in a Vickers Viscount charted by Vandervell for his team and others attending the race. He was then sent to the burns clinic in East Grinstead, but the damage was already done and he died several days later. Within a matter of weeks, Vandervell, already despondent over the death of Lewis-Evans, suffered a heart attack and made the decision to cease the operations of his racing team, although a small crew was kept on which did enter races in 1959, 1960, and even into 1961. The 1957 event at Monte Carlo saw most eyes focused on the Usual Suspects: Juan Fangio, Stirling Moss, Peter Collins, and Mike Hawthorn. After qualifying ended with Collins and Moss within a second of Fangio, many were expecting a pretty exciting race. Indeed, that is what they got for about three and a half laps. Then Moss, Collins, and Hawthorn all managed to run into one another at the chicane and Fangio motored off into the distance for yet another victory. Brooks was unable to do much to really close in on Fangio since he was suffering from the terrible heat and the exhaust fumes entering the cockpit. He was happy to settle for second. Masten Gregory and Lewis-Evans moved up to finish well at the end by finishing. The organizers extended the race by five laps in 1957 and not many really appreciated their gesture. There was some excitement at the end when the Rob Walker Cooper-Climax ran into problems just a few laps from the end and ended up in sixth place. Had it been the usual 100 laps, Jack Brabham would have had a fine finish, but instead ended up pushing the car across the line for sixth. The firm of Connaught Engineering had its name derived from the garage that its founder - Rodney Clarke - operated, Continental Cars, CONtinential AUTomobiles or Connaught. There was a group of motor racing enthusiasts that frequented the garage who all later played some role in the Connaught story - Mike Oliver and Kenneth MacAlpine being foremost among them, especially the latter since he was financing the effort. The first effort was an F2 car, the A Series which met with moderate success, but not much more than that. Clarke then prepared the drawings for a car to use when the new 2.5-litre formula went into effect. He designed it around the Climax FPE Godiva vee-8, only to have Coventry Climax pull the plug on the project and leave Connaught and a number of similar British GP projects in a lurch. Clarke then cobbled up the B Series, the first two examples which initially had streamliner bodywork. It looked great, but a bear to maintain. The rest of the B Types, chassis B3 through B7, were made with bodywork more typical of a monoposto. The bodywork on the car in question in the picture, chassis B3, was not delivered in this style. It was rebodied in early 1957 in an effort to make it a bit more aerodynamic. Needless to say it was immediately dubbed the "Toothpaste Car" by scribes and fans alike. It brought Connaught its last success, the fourth place of Lewis-Evans at Monte Carlo. MacAlpine saw no end to the bills he was paying and no return on any of his investment and so the Connaught passed into history after a long exit: the last appearance by a Connaught in a Championship round was at the US Grand Prix at Sebring in 1959 when chassis B7, entered by Paul Emery, was used by Bob Said in the race.